Woo-hoo! It’s the busy few days before Halloween, and as I’ve said before, I’m more a fan of tricky and treaty than I am of scary and creepy. This week, I planned my first-ever elementary school Halloween party for Maddy’s class (with the help of the coolest co-Room Parent ever). We put our heads together and came up with (we think!) 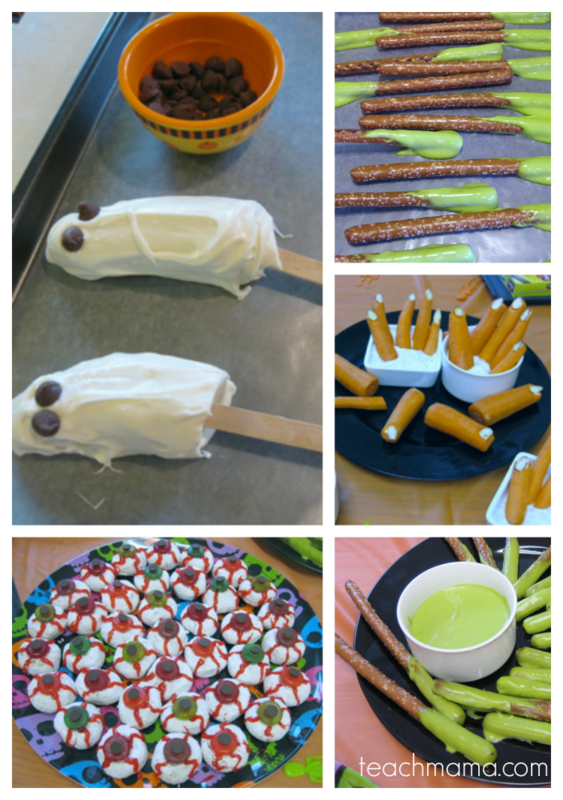 some really fun ways of rockin’ Halloween, first-grade-party style. We played a bunch of Halloweeny games but our super-easy–and super-spooky–Halloween treats are what I think were crazy cool. I put all of the recipes our family used this year at home and at school (except Dinner in a Pumpkin) on one sheet so that next year it’s all together. 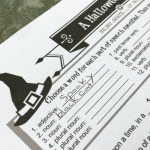 Super-Easy, Super-Spooky Halloween Treats is here to download as a pdf if you’d like. 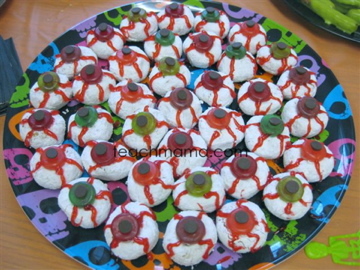 Eyeballs on a Plate: Not to worry! They’re not really eyeballs! They’re just powdered donuts, gummy Life-Savers, a chocolate chip, and gel icing. My super-awesome co-RP made these, and they look so fabulous! I am not sure I would have had the patience to make them look so realistic, but I’ve learned that my pal has crazy eyeball-making skills! The fingers were all ready. . . 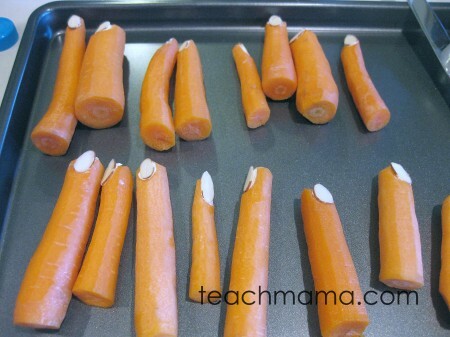 Fingers in a Bowl: So easy–and for some reason, so funny to me–these ‘fingers’ turned out completely hysterical. Peeled carrots, a little cream cheese ‘glue’ and a slivered almond for the nail are all they are, and they only took a few minutes to make.
. . . to meet their hands. I tried to pick out the long and skinny, twisted carrots, cut them in half, and that’s it. The fun part for me? Putting the hands together in the bowl of dip. Boogies on a Stick: I’ll be honest, these did make me gag as I made them. 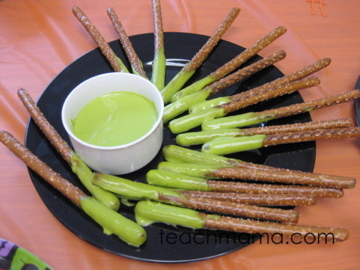 Cheese-Whiz meets green food coloring and together they meet a pretzel rod. That’s it. I read that to make ‘goopier’ boogies you could let the ‘boogies’ cool, then dip them again, but I couldn’t do it. 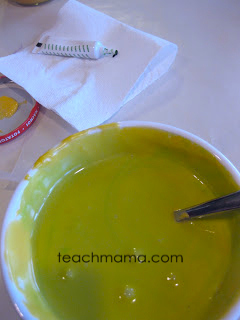 I could barely handle the bubbling mixture as I blended the Whiz and food coloring. Maddy admitted later that the Boogies on a Stick might have been ‘the absolute grossest thing she ever saw in her life’ and they tasted ‘disgusting’. Nice. Boogies on a Stick, lookin’ oh-so-yummy on their tray. 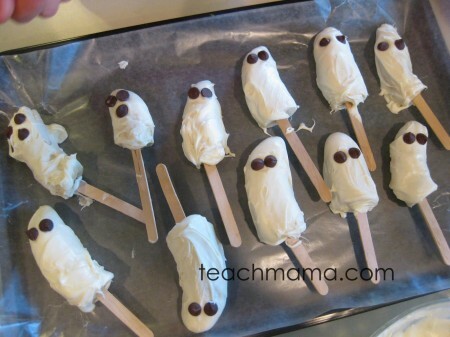 Frozen Ghosts: One that I’ve wanted to try for some time, Frozen Ghosts are really just bananas dipped in white chocolate and frozen. Yum. I did try to make mine lighter and more ice-creamy by adding a tub of Cool Whip into the melted chocolate, but these were not as easy as I thought they’d be. Some of my bananas broke when I pulled them out of the chocolate (like that poor, first guy in the photo), so things did get a little messy for Owen and me as we made them this afternoon. Soon we hit a stride, though, with me doing the chocolate dipping, and Owen adding eyes (and a mouth when he could). Owen was my right-hand Frozen Ghost makin-man today. 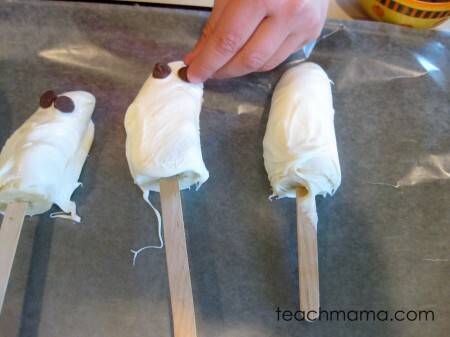 I also had a bunch of extra tiny banana pieces left over, so I dipped them in the chocolate, broke a popsicle stick in half, and gave them eyes–just for fun. Some are really ugly. 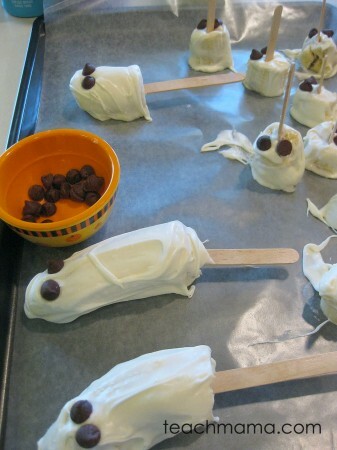 I put both trays of ghosts in the freezer and will take them out for an afternoon pre-Trick-or-Treat snack tomorrow! And that’s it. I like these recipes because they’re easy. They’re funny, and they’re quick. And the huge plus is that they’re all pretty inexpensive. It’s Dinner in a Pumpkin tomorrow and it’s been super-easy, super spooky Halloween treats all week long! Many thanks to a handful of sites and books for inspiring our Halloween treats: Family Fun & Family Corner to name just two! Want a few more fun halloween party ideas? Wow. That's all I can say. That was a lot of work. Those are some really luck kids! Thanks for sharing! 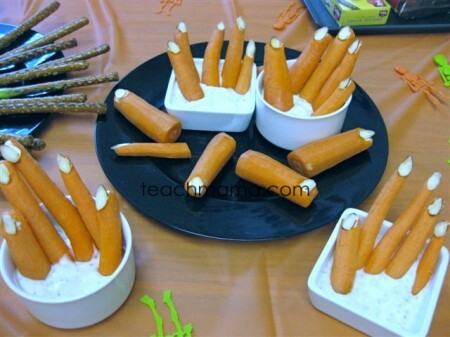 Just made the monster fingers for a party and they were a huge hit! I saved some time and used baby carrots and they came out just as cute. It was nice to bring a fun and festive treat that was also healthy. Thank you so much for the idea! The frozen ghosts are my favorite! SO cute. thank you so much, emily kate! we like them too!! You know what? I’m not sure I’ll make the Boogers on a Stick again, either. Right up there with Squid Dogs if you ask me. Gah! 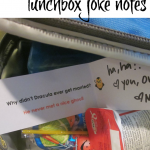 I’m a little late at discovering this post, but these are GREAT ideas. My sister is a retired kindergarten teacher and I think she will want to go back into the classroom just to make some of these. Thanks for sharing! 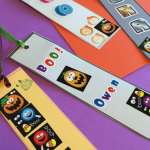 thanks SO much for writing–and hopefully someone can use them next October! I’ve been telling the kids we’d make banana ghosts for WEEKS and then finally got it all set up today and had a #craftfail / #bakingfail — I caramelized the white chocolate and turned it into brown sugar!!! So, I went searching and low and behold the road leads to you, my friend! Off to pick up another bar of white baking chocolate today. Any tips for melting it without burning it??? Candace!!! What a riot–sorry! I’m prone to many a baking fail, too, my friend! I microwaved the white chocolate chips–that’s all I did. I’m sure there’s a more professional way, but I certainly do not know it! I like the ‘Fingers in a Bowl’. Brilliant, and a bit spooky for the kids. Can’t wait to try it! Sigh. That’s what I did…I was going to use the double boiler but figured I would try a shortcut. But I had a bar, not chips. Maybe the chips will work better! I just found your great spooky-yummy ideas! Great! I’ve linked your frozen ghosts in my blog, here http://caseperlatesta.com/le-10-migliori-facili-ricette-per-halloween/. I’m italian as you can see, but your photos are so good I think also my non english-speaking reader can understand what you did to make those ghosts! Brava! thank you thank you Chiara! Totally appreciate your link and great post! !